And to counter effect yesterday’s catastrophe I present to “myself” as an antidote some real inspiration, originality, true fashion guts and enjoyment. Meet Shail Upadhyay. 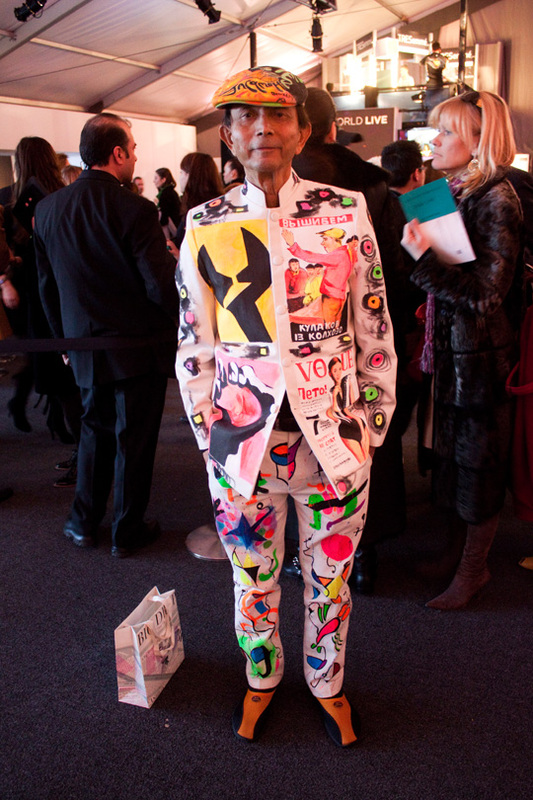 He is a NY legend with his hand painted suits. 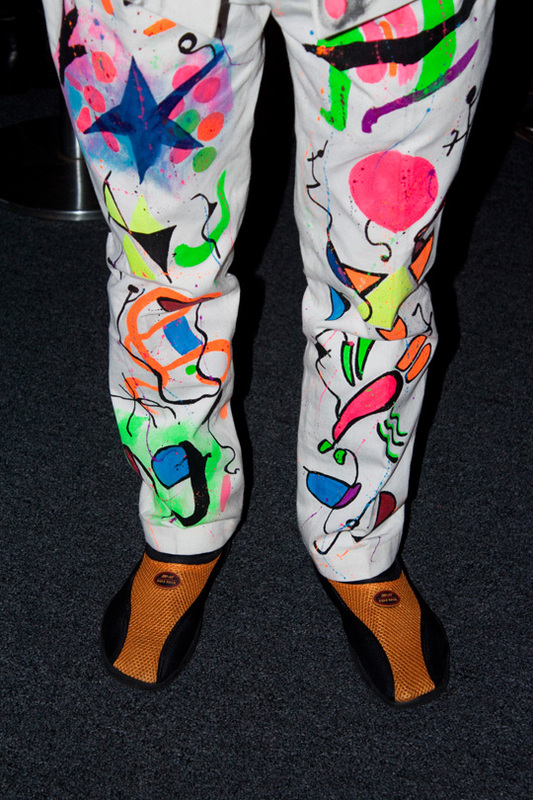 All of his suits are insanely crazy colorful with designs noone else but him can pull off. 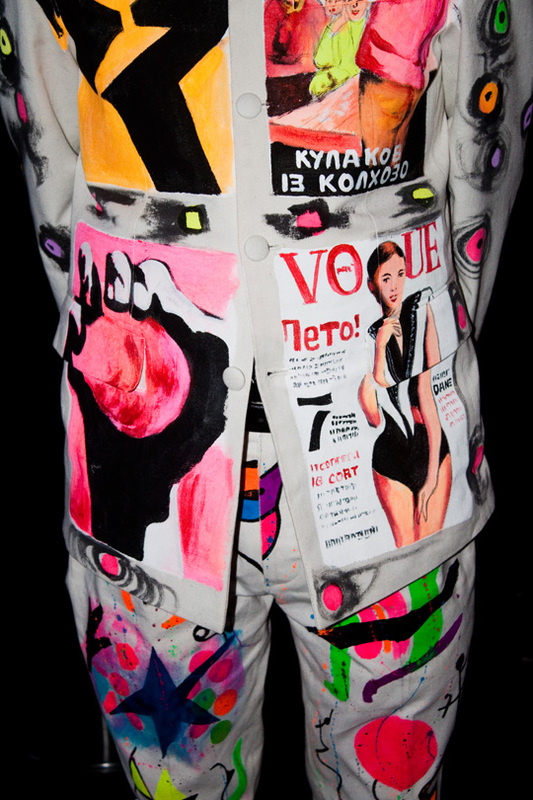 The suit in the pics has cover pages of different magazines painted on him by some struggling artist. 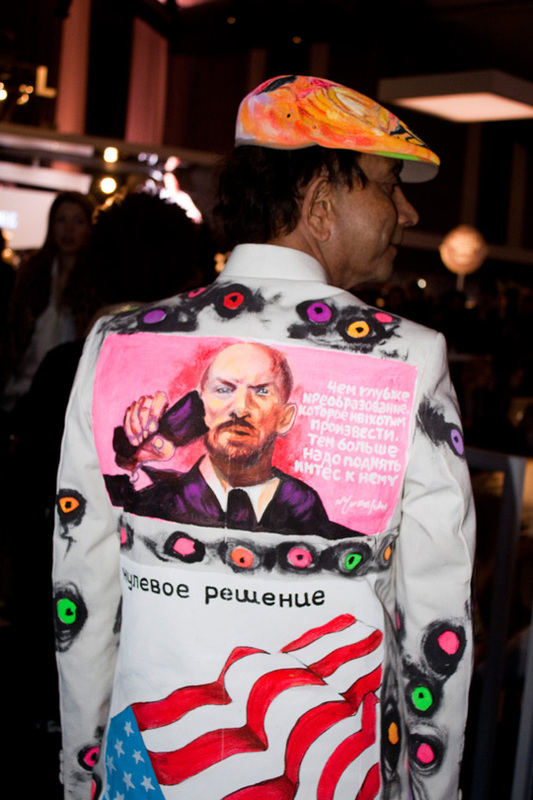 See the pages that were painted on the suit? 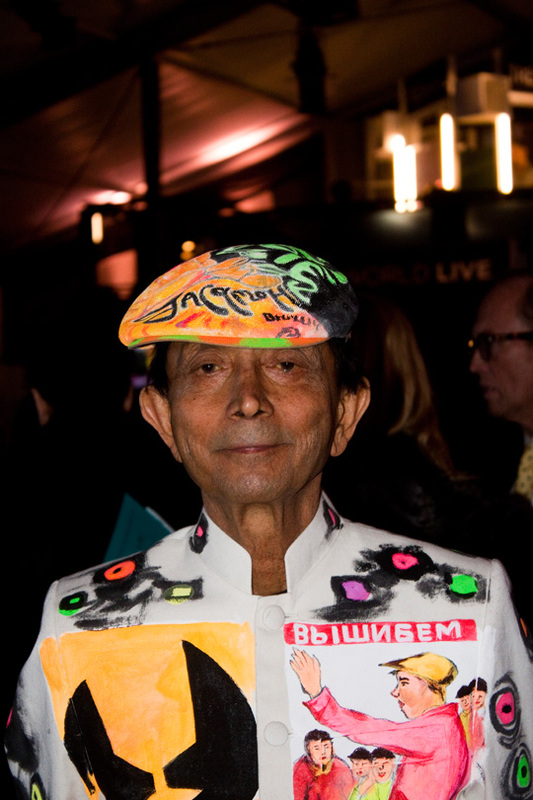 Also last Friday I saw the Bill Cunninghum Documentary and anyone and everyone who enjoys fashion, street fashion or art in general at all should definitely definitely go watch it. Just do it!!! I mean it!! Oh and BTW, Shail is featured in his documentary too. You can see many more of his suits there too. Or just Google him. I heart true talent and fashionistas. PS: Manisha Koirala is his niece [for all the Bollywood followers to know]. this is amazing! i have never heard of shail and now i am completely intrigued! thank you for providing us with something different and new to read up on! 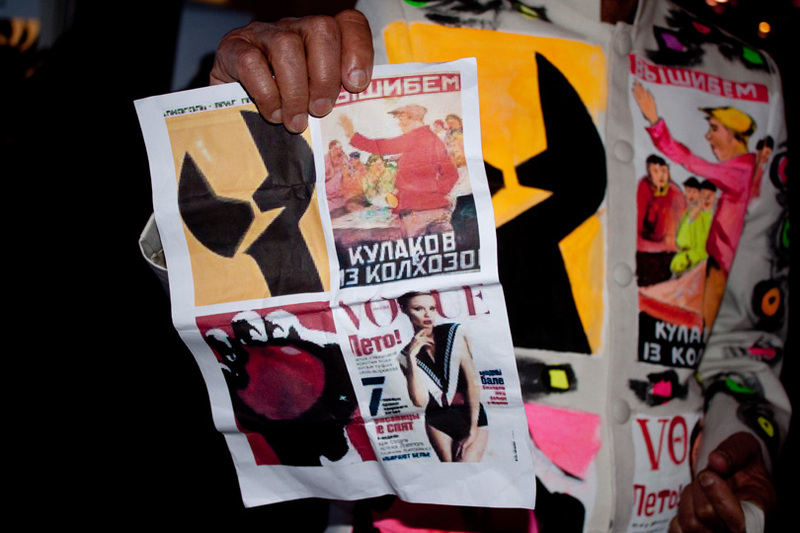 It's very interesting how communism propaganda lives side by side with Vogue cover on his suit. Wooohooo! Can anyone get cooler than that??? Kudos to him for being so so bold AND awesome!!! I am also a virgo, so I do understand!!! The suit is...I have no words. You have just taken my breath away. will definitely follow you! I love your blog and thanks for the comment! Your blog is so beautiful! Street style is such an inspiration to me! Of course I follow you, it's a pleasure! Owwww this is sooo coool! Such a great suit, I love the prints and everything wow cool! Wow what a amazing suit!! Great post darling. Thanks so much for your comment..
haha I love this guy already! that IS FUNNY! and i absolutely love it. i was kinf of wishing you took a picture of him doing something haha. amazing. btw! i just started my blog here! if you please check it out and leave any tips :) xoxoxo thanks! Wow his suit is NUTS....in the best possible way!! I love that you posted this :D.
wow, he's a dude.....im sure a man half his age can't carry off that suit!!! how wonderful to run into him, lucky you. That is rad fun! awesomeness..